Many indications point to escalation in battles’ fierceness started to show today at Al-Tayaran and Al-Jusaq neighborhoods, the outskirts of the old neighborhoods of the city, and the link to the administrative complex (The governarate, and the board of the government of Nainawq) at Al-Dawasa. The real test of the Iraqi forces hasn’t started yet. The fear of ISIL’s attempts to lure the Iraqi forces to fight inside the old neighborhoods was clear today. ISIL wants to drag the Iraqi forces into fighting inside Al-Dawasa, Bab Al-Tub, and around the old city. The Iraqi forces made a mistake by starting the battles at Al-Tayaran and Al-Jusaq. They should have started the battles from the west of the western bank, starting from Al-Ma’mun and Tal Al-Rumman, all the way to Nabils, Al-Yarmuk, and Al-Jadida to drag ISIL to the battlefields on the outskirts and for the safety of the civilians. Deepening inside the old neighborhoods of the western bank will lead to high human loses. Also, ISIL is well trained to fight inside such densed areas. The measures ISIL has taken in those aras, like opening passages through houses, provides a great military coverage and unprecedented flexibility of their movement. The battle will be more complicated if the operations don’t start on the north side (Musheirifa, Hawi Al-Kanisa, & Al-Harmat) and ISIL will succeed in dragging the forces to fight inside the old city. The iraqi forces MUST start to push ISIL from both the north and the west, where those areas are open spaces and easy to target ISIL by the airforces. The old city of Mosul never witnessed any fighting since 2003, except for some areas in Al-Dawasa, therefore, it is a very challenging area. The jihadists used to avoid this ara fearing of traps. Today, ISIL is entrenched very well in this area, knowing its ins and outs. This part of the city is a maze! 1- ISF has a previous experience in fighting in those areas as they are open neighborhoods where is it easy to utilize helicopters and vehicles can maneuver easily. Those neighborhoods once recaptured will avoid any battles in the neighborhoods behind them. 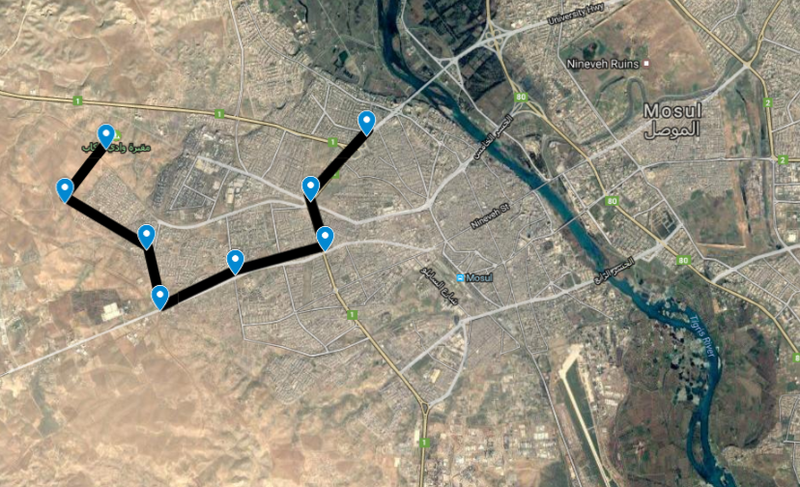 2- The roads in those areas lead to the third bridge, which will enable the Iraqi forces to overlook Hawi Al-Kanisa on two sides, from the eastern bank and the western bank. This will open the north front. Also, those neighborhoods got many entrances and exits, which will allow the iraqi forces to disable ISIL’s movement. 3- Any embroilment of the Iraqi forces in raiding the old city will result in a catastrophe among the Iraqi forces and the civilians together. Since 2003 until ISIL’s invasion of Mosul, the old city never witnessed any battles as it is well known to be impenetrable and impossible for military operations, even most of the US operations failed in those neighborhoods. Yet, ISIL, over the past two and a half years, trained its members to fight in such areas. Neighborhoods like Al-Nabi Shiit, Mahallat Al-Sajin, Bab Jidid, Al-Tawafa, and Al-Faruq are a net of mazes, even its native residents lose their way in it many times. The buildings are very fragile and unable to stand any military operation. The slightest operation would result in a human catastrophe. 4- Today it was evident that ISIL increased its numbers of car bombs and suicide bombers in Al-Tayaran and Al-Jusaq. 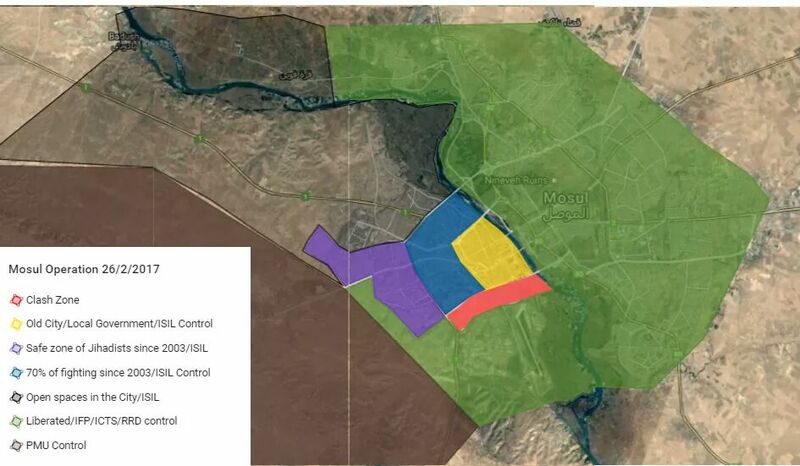 It is important to eliminate Wadi Iqab industrial district where ISIL’s supplues of weapons and car bombs are located. Next So, What is ISIS? I can not understand with all forces and military power from Iraqi, to UK special forces, US forces, we hear gain and again ISIS flee the area of the city toward turkey/Syria ? Till now no TV, or news outlet shows ISIS fighters with their usual dress (All-in- Black) what happen to their Dress? If they believer in Jihad and committed themselves for their believe , were are they? why the flee?